Five people died overnight in the Gaza Strip in continuing clashes between militiamen linked to rival factions. 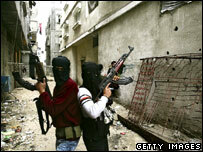 In Gaza City, Hamas gunmen attacked the headquarters of security forces closely associated with political rival Fatah. Fighting between the governing Hamas faction and Fatah has left close to 30 people dead since Thursday. It is the worst violence since Hamas came to power a year ago and has halted attempts to hold talks on forming a Palestinian national unity government. The violence escalated after a Hamas member was shot dead outside a mosque in Khan Younis, sparking clashes in the southern town for many hours between Hamas and Fatah supporters. Gun battles continued there and in the north of the Gaza Strip until daybreak. In Gaza City, parts of the town were plunged into darkness as an electrical transformer was knocked out during the fighting overnight. Several local commanders were reported to have been kidnapped and both factions have set up roadblocks around the offices and homes of their leaders. Palestinian Information Minister Youssef Rizka, of Hamas, warned that the two sides were close to civil war. Hamas and Palestinian President and Fatah leader, Mahmoud Abbas, have agreed to mediated talks proposed by Saudi Arabia on Sunday but no date has yet been set. The two factions had been making renewed efforts to form the national unity government which would satisfy the demands of international donors.